We are frequently asked why the International Bank of Amherst has not merged with one of the larger banks. We believe our community would suffer if it didn’t have a locally owned and controlled bank. As an independent community bank, we are owned and operated by people from the community . . . you can find them in church, in the grocery store, and at the PTO meeting. Our employees are active in our community and volunteer time for local organizations, events, and fundraisers. Since we were founded in 1893, we’ve had the same name, we’ve been at the same location, and we’ve continued to use the same guiding principles when making business decisions. Our decisions are based on what we see and know about the local community. Our decisions are made by people who live here - not by nameless members of a board who live hundreds of miles away. Too often, their decisions are based on computer printouts and financial trends of larger cities. Our interests are your interests - only when the community prospers will we prosper. Nearly all the money deposited in this bank is reinvested back into the community in the form of loans and investments. This generates jobs, which lead to purchases, which lead to local economic expansion. Only through a community bank do dollars earned at home, spent at home, and banked at home make their way to investments that, in turn, nourish the community that made them possible in the first place. 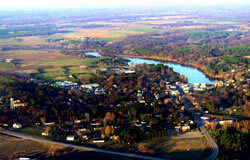 The Tomorrow River area was first settled in the early 1850’s. The Tomorrow River, Flume Creek, and Spring Creek provided power for the grist and saw mills in the area. In 1871 the Wisconsin Central Railroad was built through here. The Green Bay Railroad was built in 1872 passing just north of the Village of Amherst. As a result of the two railroads and Federal Highway 18, the area became an important business center for buying and selling potatoes. The community needed a bank, as the nearest banks were located in Stevens Point and Waupaca. There was talk for many years of establishing a bank in Amherst. On November 25, 1892 a meeting was held in the office of H.H. Nelson where 19 citizens of Amherst and Stevens Point subscribed for stock in the total amount of $25,000. The first stockholders’ meeting was held on January 6, 1893. 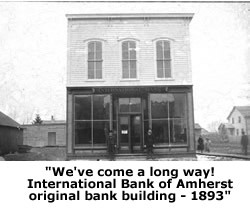 It was decided that the name of the bank should be “The International Bank of Amherst.” The articles of incorporation were signed and acknowledged before Justice H.H. Scott. On the 2nd day of May 1893 the bank purchased the lot and building located on the corner of Main & Wilson St, owned by H.H. Nelson. The board of directors agreed to remodel the building that was built in 1851 and rent out unused space on the second floor. The present bank building was constructed on the same site in 1920. It has been remodeled several times, but materials were re-used or duplicated to retain the original appearance. A large addition & remodeling project was completed in 2002. One hundred years is a long time for any business to survive, including banks. The bank remained strong through several “banking panics”. There were two major crises that the bank successfully overcame. The first was a robbery in 1899 when over $5,000 was taken. A special stockholder meeting was held and the stockholders agreed to being assessed to cover the loss. The robbers were caught a few days later in Wausau and some of the money was recovered. The same principles apply today: prudent lending, avoiding speculative investments, making a reasonable profit, and maintaining a strong capital position. We have always made our customers our number one investment priority. Whether it’s the expansion of a current business, start up of a new company, or the financing of a family vehicle or home, we are here to meet those needs. There has been a Pomeroy managing this bank continually since 1898. My great grandfather, L.A. Pomeroy was one of the original stockholders. He resigned his job in 1898 with a Stevens Point bank and came to this bank. Harry B. Pomeroy, my grandfather started in 1911. My father, L.A. Pomeroy, began his career here in 1948. I joined the bank in 1974. We are proud to be an independent community bank. Since our bank is locally owned, all decisions are made right here in Amherst. No decisions are postponed because of out of town control. Please feel free to visit with us if you would like further information about our bank. ©2010 International Bank of Amherst. All rights reserved. Powered by ProfitStars. NOTICE: International Bank of Amherst is not responsible for and has no control over the subject matter, content, information, or graphics of the web sites that have links here. The portal and news features are being provided by an outside source - The bank is not responsible for the content. Please contact us with any concerns or comments.